CADA Chairman, Anthony Santucci, today gave the following remarks to Hamilton Rotarians on the topics of Educating the Community about Sobriety Checkpoints, what they look like and what they are designed to do. 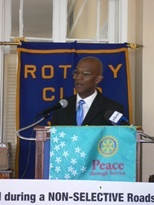 "Good afternoon President Simons, Rotary members, ladies and gentlemen. It is always a pleasure to speak at Hamilton Rotary lunches each April. As you know, April is Alcohol Awareness Month. At CADA, encouraging responsible alcohol behavior, we host a number of activities each year to increase the public’s awareness of what responsible alcohol consumption looks like. This year, we have two goals for the month. They are to educate the community about sobriety checkpoints, what they look like and what they are designed to do. Our second objective is to encourage open dialogue between adults and young people and children about not drinking alcohol until at least the age of 18 years and about responsible drinking after age 18 years. The Department for National Drug Control recently issued the results of a study they conducted amongst students in P5, P6 and M1. Students in 34 public, private and home schools participated. The report indicates that the number of children who use alcohol and drugs tends to increase as they get older. For instance 33% of 12 year olds reported using alcohol compared to 17% of 10 year olds. he DNDC report highlights what we at CADA believe every parent, grandparent and guardian should know about young people and the use of alcohol and drugs. The following statements are taken directly from the report. Youths who drink are also more likely to be victims of violent crime and sexual assault. They are more likely to have serious problems in school, be involved in drinking-related traffic crashes, and develop problems with alcohol later in life. 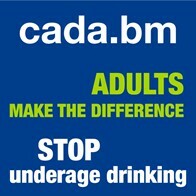 To this end, CADA has developed a number of techniques to help parents as they work with their children and young people to ensure they understand the importance of not trying alcohol before the age of 18 years. The role of speaking with children within our sphere of influence about alcohol falls on the shoulders of all responsible adults. It is often a difficult topic to broach and we recommend that several talks take place, not just one big talk. Expect these types of tough questions and more. However don’t shy away from the discussion because you may have to answer these types of questions. This is even more reason to hold the conversation and to encourage an open and honest dialogue about a serious issue that if not prevented could have lasting health implications on the child. The purpose of having these Checkpoints is not to catch people. The goal is to use public awareness messages to inform the public that these Checkpoints will be taking place, therefore members of the public know that if they choose to drink and drive the likelihood of them getting caught is high, thus they decide to take a cab or have a designated driver instead. "According to the Organization for Economic Cooperation and Development – OECD, Bermuda has one of the highest rates of road fatalities – 20 per 100,000. The OECD average is 9.6 per 100,000. From the year 2000 to 2012 135 people died on Bermuda's roads. To view the list of people who have died on our roads click here. Sobriety checkpoints change behaviors and thus help save lives. Legislation is needed to provide for sobriety checkpoints in Bermuda. Sobriety checkpoints are temporary or mobile installations set up by the local police department, usually late at night or during the early hours of the morning – when the majority of road traffic fatalities are recorded. The police decide ahead of time that every nth vehicle will be stopped. In other words, the police decide ahead of time that they will stop every 10th vehicle, or every 20th vehicle, this is called Non-Selective Testing, it is Non-Selective because there is no room for profiling in any way, once this decision has been made, the checkpoint begins. The driver of every nth vehicle is stopped and roadside breath tested. Giving alcohol to someone who is under the age of 18 or turning a blind eye when a young person is consuming alcohol is dangerous and irresponsible. Step in and put a stop to it. It is proven that those who begin consuming alcohol before the age of 15 are 4 times more likely to become addicted to alcohol than those who wait unitl age 21, each additional year of delayed drinking onset reduces the probability of developing alcoholism by 14%. Some adults use alcohol as a "special occasion celebration," perhaps allowing their child to have a sip of beer or champagne or wine. We must advise strongly against this. The objectives for Alcohol Awareness Month, 2013 are to raise public awareness about sobriety checkpoints, how they operate and the results they can achieve, and, to increase public awareness on the importance of keeping alcohol out of the hands of children and teens. The Minister of Transport, The Honorable Shawn Crockwell JP MP, has expressed this Government’s commitment to ensuring that roadside breath tests for drink drivers become admissible evidence in court. There are currently no police powers at law, for demanding and taking breath samples on the road. CADA supports the enactment of amendments to the Road Traffic Act 1947 to enhance police powers to demand and take breath samples from motorists. CADA is advocating for a joint, well-publicized, nationally branded sobriety checkpoint enforcement campaign that will create awareness amongst motorists that if they drink and then drive their apprehension is inevitable. Parents and adults must take personal responsibility for making alcohol less accessible to our young people. The younger a person is when they begin consuming alcohol, the more likely they are to develop an addiction to alcohol, those who begin drinking alcohol before the age of 15 are four times more likely to develop alcohol addiction than those who wait until age 21.
alcohol out of the hands of young people, by taking alcohol out of the fridge and cupboards and locking it away making it less accessible to our young people. We encourage open dialogue between parents and adults with young people about not drinking alcohol until at least age 18 and about responsible drinking after age 18. CADA Chairman, Anthony Santucci's remarks, "Good morning Minister for Public Safety, the Hon. Michael Dunkley, JP, MP; Shadow Minister for the Department for National Drug Control, Kim Wilson, JP, MP; Assistant Commissioner Martin Weekes from the Bermuda Police Service; ladies and gentlemen of the media, thank you for being here this morning. Today, April 1st 2013, is the start of Alcohol Awareness month. Each year CADA, encouraging responsible alcohol behavior, works to raise the community’s awareness on responsible alcohol behavior. This year, we will focus on educating the community about Sobriety Checkpoints, what they look like, what they are designed to do and how they will benefit Bermuda. We will share the research on best practices and the effectiveness of this important initiative on reducing the number of alcohol related road collisions and fatalities in other jurisdictions. Additionally, we will work to encourage and support open dialogue between adults and young people and children about not drinking alcohol until at least the age of 18 years, and about responsible drinking after the age 18 years. Throughout April, we will host a series of presentations, to view the Calendar of these presentations click here"
CADA is pleased to announce that Dr. Joseph Froncioni has accepted the invitation to join the CADA Board. Making the announcement was CADA Chairman, Mr. Anthony Santucci. Mr. Santucci stated, “Dr. Froncioni brings to the CADA Board extensive knowledge and a strong background on road safety. He is known in Bermuda for his work with the Road Safety Council, where he served on the board for five years as the medical representative and as Deputy Chair and then Chairman. Dr. Froncioni, an orthopedic consultant by profession, was the co-author of a study, Road Traffic Injuries in Bermuda 2003 – 2004. The study was made public through a series of presentations over the course of a year to various organizations and government bodies throughout Bermuda. The study brought to light the magnitude of Bermuda’s road safety problem and made specific recommendations for improvement. CADA, encouraging responsible alcohol behavior, today announced that Burrows Lightbourn Ltd. will continue their $10,000.00 Silver Sponsorship of the free, late-night, don’t drink and drive taxi service, Let Us Drive. Making the announcement was CADA Chairman, Mr. Anthony Santucci. "There have been several collisions and one fatality on our roads so far this Holiday season. We want to prevent any more. We also want to extend our most heartfelt condolences to the family and friends of Mr. Malik Weeks who tragically died on our roads a few days ago. Mr. Weeks was the 9th road fatality this year. We DO NOT know the cause of this particular tragedy, but we do know that a large number of the deaths which occur on Bermuda’s roads involve alcohol or drugs. Our role at CADA is to encourage responsible alcohol behavior and our message today is simple, before you go out, put a plan in place as to how you will get home. Remember ABCD – Always use Bus, Cab or Designated Driver. Together we must remain focused, committed and continue to take responsibility to eliminate drinking and driving."